The Grate Pumpkin was released in the beginning of October and is SOLD OUT. Frosted was released late November and is IN STOCK. These 7" Grateful Dead Bean Bears come with a hang tag. Both bears were retired in 2003. Only 20,000 of the Grate Pumpkin were produced. 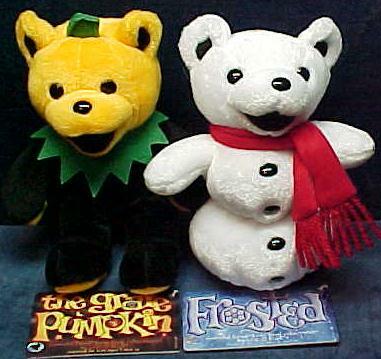 The Grate Pumpkin and Frosted are $8.50 each plus shipping. Shipping for one or two bears is $5.00 by Priority Mail in the United States. For 5 or more bears shipping is FREE. You may combine the 5 or more from any bean bear or turtle we have in stock for individual sale. Credit Cards through PayPal only.